Best product for hair that I have found! This new series of Ayurveda hair care products, has the best result, in my experience, on colour treated hair. Over the last ten years I have been hunting for a product that would help my hair be more presentable on the days when I do not go to the hair dresser. The amount of times I go to the hair dresser annually is minimal. Ergo, bad hair day was very much the norm and my hair dresser doesn’ make much money from me! I am one of those women you see in the shop who is standing holding three different bottles of shampoo and conditioner reading and rereading the back of each bottle. So the hunt has been long, arduous and sometimes expensive. I searched, perused, examined contents, tested, used, was impressed and ultimately distressed by the majority of main stream hair care products. Even those with claims of special shampoo for damaged hair, oils before shampoo, conditioners to ease frizz and frying, leave in conditioners, leave in hair treatments, frizz spray repair, there is an exhaustive amount of different types. Whatever the advertising was telling me, no matter how much I believed what I read, even understanding words I had to research for the full meaning…the products were always a short term reprieve and a long term disappointment for my hair. That is what I love about Ayurveda. We have Virya – the short term cooling or heating effect of using a specific remedy. And next Vipaka – the effect of using a remedy for a longer period. I am not biased in anyway towards any special Ayurveda hair care treatment and I have been shopping along time in mainstream shops for the best hair treatment, whoever produced it. But the results don’t lie. 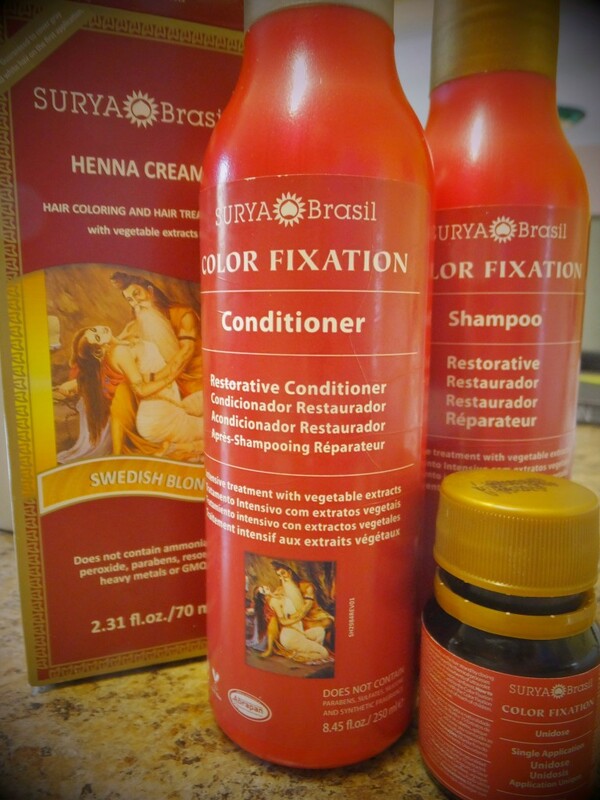 My first time using this Surya Brasil shampoo and conditioner (€10.99 each) I didn’t know what to expect. The packaging was attractive but not excessively glamorous. It’s great they keep the cost for the product in the bottle rather than for marketing. The picture on the packaging is, this is a total guess from what I know and have read, a well chosen portrait from Hindu mythology of the god of creation, Brahma and the Hindu goddess of knowledge and learning, Saraswati. Together combined, life begins and thrives. The picture and myth are an obvious reflection on the systemic work that Surya Brasil have done to bring such a positive influence into hair care. The bottles are screw top, it is my only gripe, I prefer a squeeze top that can stand upside down to make the lotion deliver easier. The shampoo, has a rust coloured plastic screw top and is different than any other shampoo I have used. It is a little gloopy, coming out of the bottle with ease, slightly watery, with a yellow tinge and yet is transparent. When you wash your hair for the first one or two times, it may not suds up at all or as much as your past products. But my hair still felt clean even without suds. Since it was coming from an ethos of completely natural, I wasn’t expecting cascades of bubbles. Without bubbles the shampoo doesn’t have to impress you and can just clean your hair gently like it should. It makes me wonder, who thought of this great generational mental conditioning? Who told us bubbles should be in our shampoo anyway? Why do we expect bubbles, and why do we think without bubbles the product may not clean as well? The conditioner has a silver coloured plastic screw top. It is off white in colour, very thick, very rich and it doesn’t slide away and try to escape out of your hand. It sits and waits for you to do the job spreading it through your hair with your fingers. I used enough conditioner for three heads the first time around. Beginners mistake. It is so rich you don’t need as much in your palm to cover a fine to medium head of hair. It is luxurious and reminds me more of a hair treatment than a general conditioner. It was like going back in time. My hair felt happy again. I look a lot more relaxed now that my hair isn’t standing out sideways, and nor is my hair staying in one place when I turn my head! We are reunited again. Can’t thank Surya Brasil enough for all the hard work and efforts to make such a great product that is affordable and also does what it promises, it cleans and gently nourishes you hair without leaving it greasy. Just fab. Go out and try it, in Thurles you can purchase it at Health and Harmony, Baker street, Thurles.